3Character.com reports a minimum wholesale of $3850 on 3 letter .coms today versus $7600 last June — I honestly believe the minimum today is even below that $3850 suggested price, likely around $3500. With 3 letter .coms, it would be important to make sure the number of premium and non-premium sales being looked at are identical between now and then, else the data will be heavily skewed. At present, a premium 3 letter .com sells for about 2-3 times more on average than what a 3 letter .com with bad letters in it will sell for. Nice comparison. Let’s go further. An investor’s annual revenue is a minimal 3% the stock value. Does a 10k LLL.com domain earns $300 a year without any work (e.g. parking revenue)? As you said, this is a first attempt at analyzing domain valuation compared to the stock market (DJIA) which is more liquid. Eventually, is should also be compared to something that is not as liquid as stocks. Like, commercial real estate, land, residential property, timeshares, etc. Judging sales for a group of domains that is categorized by the number of letters in the domain is so 1999. Would I rather have Omaha.com over BeverlyHills.com? Not in a million years. Real sales in our industry should be tracked by name (regardless of length), its public recognition/usage and potential value to prospective endusers. And that’s the reason why Ad.com, Toys.com and Candy.com recently sold so well. David, your last point is the reason for the methodology. 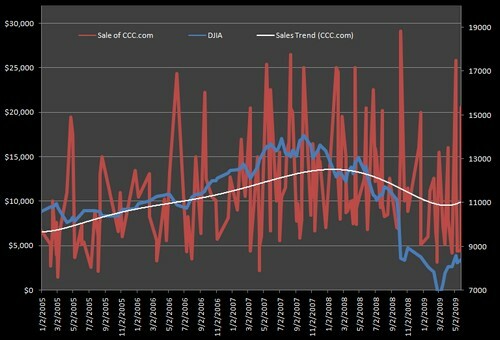 As they are unique assets, trends using total sales, averages, etc. are overshadowed by what’s sold. Thus the purpose of the data described is to minimize variability from unique domain characteristics. I might add the data was also evaluated using a normalized index and yielded the same trends. No doubt domain investments are much smarter than stocks.